Hear, O earth; behold, I am bringing disaster upon this people, the fruit of their devices, because they have not paid attention to my words; and as for my law, they have rejected it. What use to me is frankincense that comes from Sheba, or sweet cane from a distant land? Your burnt offerings are not acceptable, nor your sacrifices pleasing to me. (Jeremiah 6:19-20). a fragrant composition prepared by the “art of the apothecary.” It consisted of four ingredients “beaten small” (Exodus 30:34-36). That which was not thus prepared was called “strange incense” (30:9). It was offered along with every meat-offering; and besides was daily offered on the golden altar in the holy place, and on the great day of atonement was burnt by the high priest in the holy of holies (Exodus 30:7 Exodus 30:8). It was the symbol of prayer (Psalms 141:1 Psalms 141:2; Revelation 5:8; Revelation 8:3 Revelation 8:4). Source Easton’s Illustrated Bible Dictionary, 1897. Public Domain, copy freely. In today’s verse from Jeremiah we read that the LORD had become angry with a sweet smelling offering that was devoid of obedience and love for His law. An empty sweet smelling fragrance would do nothing to satisfy Him or render the giver justified in any way. It’s ineffective. Instead, such an empty sacrifice incurs wrath. The notion of ineffective perfumes reminded me of the 14th century bubonic plague remedy. 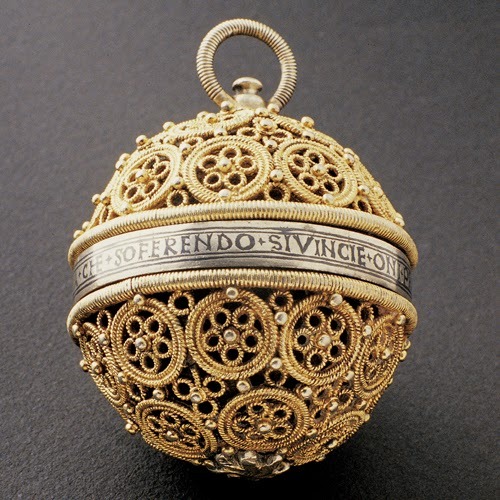 People were told to carry pomanders, which were perfume balls containing herbs, flowers, and spices, either around their neck or in their hand, and to sniff it constantly so as to ward off the disease. Pomanders are traditionally mixtures of fragrant substances which are often held within a container – although the term can also be applied to the container itself. The odours given off by the mixtures were once believed to offer protection against disease and they are particularly associated with times of plague, from the 1300s onwards. Their use is linked to centuries-old miasma theories which suggested that disease was transmitted through foul-smelling air. Keeping a sweet-smelling pomander close by was believed to offer protection. Miasma theory posited that disease was carried by a cloud of poisonous vapor in the air, which was created by decay and could be identified by a bad smell. Following the logic that bad smelling air carried disease, it makes perfect sense that you could “cure” the air by making it smell good. Hence the perfume. And the long nose to stuff good smelling material into. It seems silly to think that a perfume ball containing a few herbs and sweet-smelling spices would protect one from bubonic plague! But just as silly were the Jews who thought that they could disobey Him all day long and at the end offer the Lord God a sweet smelling offering and everything would be all right. Such empty fragrances do nothing to ward off the disease of sin. Nor would they protect one from wrath and judgment. So what would satisfy His wrath and stay His judgment? The good way is traveling the road of His word. It pleases the LORD and it gives rest to the rebellious soul. We also would do well to inquire as to where the good paths are, and walk on them. The sweetest scent of all is obedience.